Choose Kukup for your next vacation! This place is popular with visitors and surrounded by beautiful forests, jungle and rainforest. 280 kilometres to the northwest lies Kuala Lumpur, the capital of the country. Feel like exploring the region around Kukup? If so, make your way to Singapore, a major tourist hub. It's approximately 45 kilometres to the east of Kukup. During your visit, see the National Orchid Garden and the Chinatown Heritage Centre. Grab your towel and spend the arvo at one of the charming beaches this region has to offer. Put your feet up, relax and let worry wash away with the sea. Organise an outing with friends to Palawan Beach, 45 kilometres to the east. Or, you could try Siloso Beach, which is 45 kilometres away. True adventurers shouldn't forgo the region's interesting natural attractions. Relax at Bukit Timah Nature Reserve, located 35 kilometres from Kukup. Alternatively, Tanjung Piai Johor National Park is just 12 kilometres away. In Johor Bahru, 40 kilometres to the northeast of Kukup, you'll discover Tan Sri Hassan Yunus Stadium, the stomping grounds of the Johor Darul Takzim F.C. Don some red and blue, and help support the area's soccer idols at this well-loved sports ground. You might like to visit some of the neighbouring region. Tanjung Piai is 10 kilometres to the southeast. Alternatively, Pontian is 17 kilometres to the north. Be sure to check them both out. Keen to get outdoors and explore the region? Try your hand at some mountain climbing or hiking while you're staying in the Johor area. Whether you're more interested in shore fishing or sunbathing, it's easy to relax in the Johor area. Be sure to check out the guided nature walks and culinary tours running in Johor. These tours are an excellent way to gain some new knowledge and meet some local characters. Slip on your togs and rashie, slap on sun cream and prepare yourself for a morning of fun by the water. In Johor, you can choose from swimming and snorkeling. Before you bid Sampai nanti, don't forget to pick up one or two souvenirs to remind yourself of all the great times you've had in Kukup when your back home. Departing from Kukup is easy if you book flights. It's closest airport is Changi Airport (SIN), which is some 60 kilometres away. 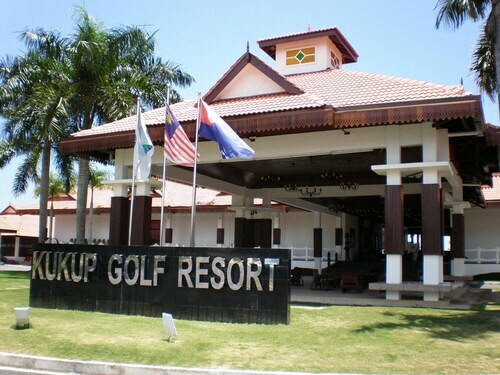 Situated in Kukup, this golf hotel is within 32 mi (52 km) of Puteri Harbour, Legoland Malaysia, and Sanrio Hello Kitty Town. Paradigm Mall Johor Bahru and Sutera Mall are also within 32 mi (52 km).